So, I just got back into the country yesterday. Hubby and I went with my dad to Israel for 10 amazing days. It was my first time to Israel, and my first time anywhere in the Middle East. Awesome! I'm in a bit of a jet-lagged, post-vacation fog at the moment, but eventually I'll settle back into a routine. I'm in the middle of a book right now (Settlers of Catan...yes, it's inspired by the board game) and thinking of seeking out some good Middle Eastern literature for my next read. Also, anyone knowledgeable about oud music and musicians? I heard some while I was there and loved it. 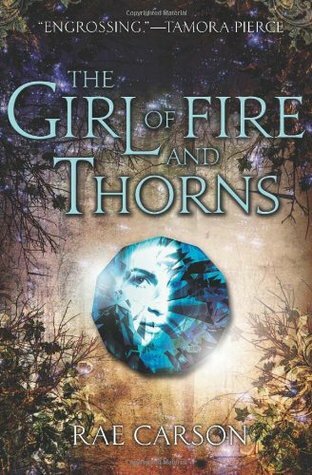 The Girl of Fire and Thorns, by Rae Carson is on the surface a fantasy story about a princess who becomes a hero. At it's core, it's a book about a teenage girl with a seemingly perfect older sister, low self-esteem, and a destiny/calling she can't quite wrap her head around. It's about a girl who learns to rise to the occasion, to believe in herself, and learns about frienship, family, and love. I enjoyed a lot of things about this book. For one thing, I enjoyed the Spanish/Latin-inspired world. It's always nice to see a fantasy world that doesn't look exactly like Western Europe in the Middle Ages (not that I don't love those too). A very Catholic-inspired religion factors heavily into the story -- Elisa is the bearer of a godstone, a jewel magically (divinely?) placed in her naval at her christening (so...a supernatural belly-button ring?) which sets her apart as being chosen by God for some great purpose. It's interesting to see Elisa's relationship with this destiny -- she is very devout, but still has a lot of doubts and questions. She's been kept in the dark about a lot of things most of her life, despite years of study, so it's neat to see her process things when she makes new discoveries and revelations. And speaking of Elisa...love her! She's got the self-pity thing going for a while, but it's great to see her overcome that. She really grows in a very realistic and organic way throughout the book. One other interesting aspect to the story, is that Elisa is very overweight through a big chunk of the book. Due to some external circumstances (a forced trek through the dessert and some other spoilery things I won't mention), she does end up losing some weight. Some reviewers have expressed disspointment that Elisa doesn't gain confidence until she loses some weight...but I think that her losing weight is only a small part of the journey Elisa makes. She doesn't even notice for quite a while how much different she looks physically. I think it's all the circumstances surrounding her weight loss that really cause her to change her view of herself. It is interesting though, to see her realize the power that comes with a more socially-acceptable body. Overall, I like the inclusion of this character aspect, and think Carson handled it well. There wasn't really anything I disliked about the book -- some of the secondary characters were more three-dimensional than others, but all were well-drawn and real. I especially loved the two different priests that Elisa befriends and talks to -- each different and unique. While they each helped Elisa figure things out that further her journey (and the plot), they managed to be much more than just expositionary plot-devises. The romance didn't really make me swoon -- but I found it believable, and really to me this book was less about romance and more about Elisa's personal journey and that whole there's-a-nation-with-sorcerers-coming-to-slaughter-us thing. So kudos to Carson for using a light touch. It should also be noted that Carson is not afraid to kill off a character -- the danger is not imaginary, readers. The pace of the book was also really spot on -- the action moved along at a steady pace but never felt rushed. There was plenty of time for the introspection needed for me to really buy Elisa's growth, but it fit seamlessly into the plot. Bottom line: an excellent coming-of-age book with magic, princesses, and fantasy kingdoms.